THE FOLLOWING ARE some recommended Easter Links for your study or inspiration during this Easter holiday season. Lots of Easter resources here, as well as links to other useful Easter pages. 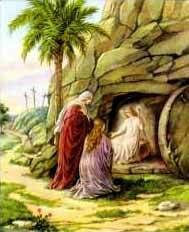 Questions and Answers, Children's activities, and Resources about Easter and the Resurrection of Jesus Christ. If the resurrection did not take place then Christianity is a false religion. If it did take place, then Christ is God and the Christian faith is absolute truth. From the Institute for Creation Research. An Easter story for kids from Christianity Today.